Needless to say, we didn’t quite drink them all. We did, however, accomplish two important goals: we met a ton of fascinating winemakers, and we tasted loads of diverse and delicious wines. In this dispatch the Winos hope to share with you some of our favorite experiences of the day so that you can live vicariously through us, as we know so many of you like to do. The man himself pours us the white; Jordan loves him some Viognier; Blair wins the prize for fanciest ornamental water jug. 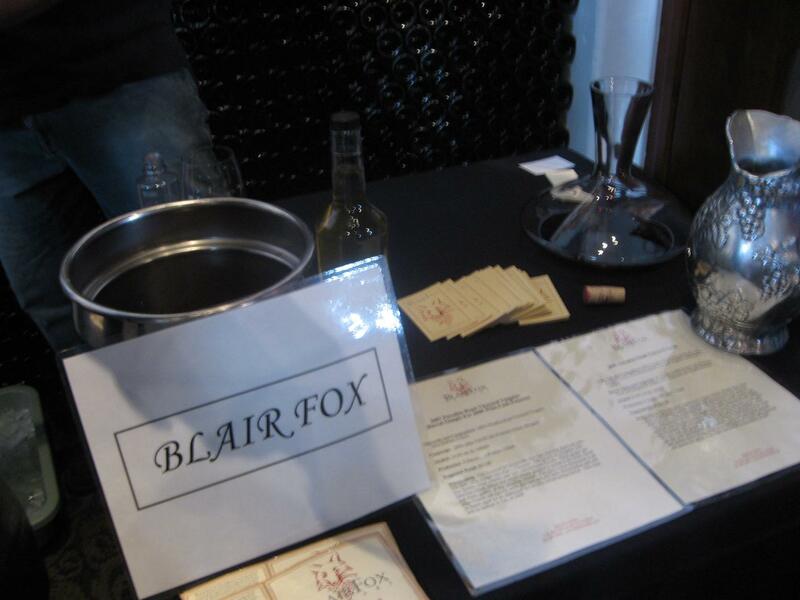 The 2007 Blair Fox “Paradise Road Vineyard” Viognier, done in neutral French oak, had one of those Viognier noses you just want to bite into: orange blossom, a little coconut, almost a tropical drink. Great mouthfeel with some nice acid; Jessica got smoke, and Jason got some spice. (As with many of these unreleased wines, the taste you experience right now may not be quite the same as it tastes upon release, which adds another level of intrigue.) 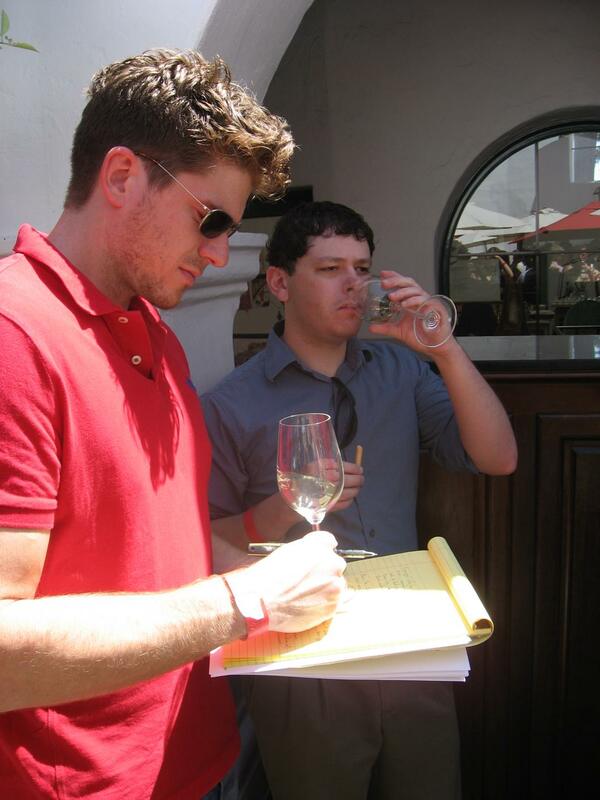 The 2005 Blair Fox “Paradise Road Vineyard” Syrah, also unreleased, treated us to a lush nose, with Jordan picking out some brown sugar; the palette followed suit with classic Syrah notes of leather, ink, and game. 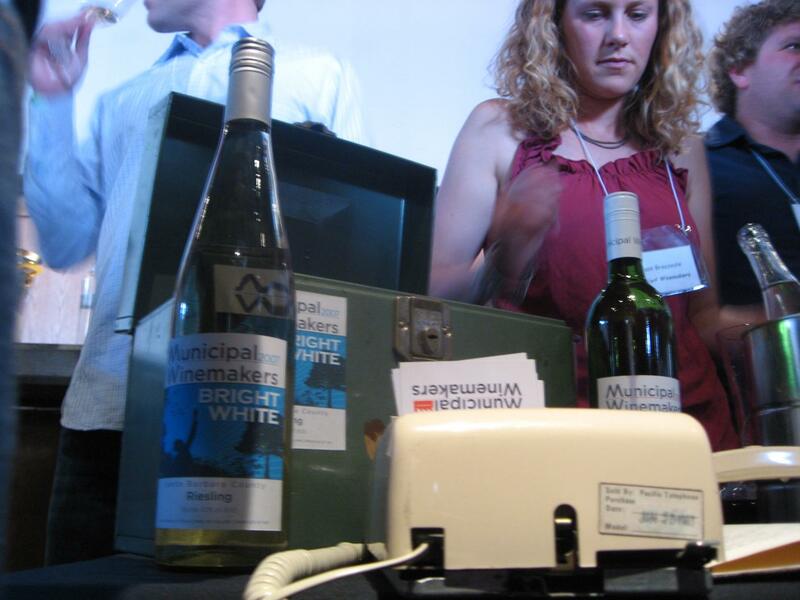 Next up was Blair’s friend Dave Potter, pouring a white and a red from his brand new Municipal Winemakers label. Dave’s a big believer in expression of place; he cut his teeth in Australia and has crafted his 2007 “Bright White” Riesling in a dry style reminiscent of that country. The nose might fool you: it’s resplendent with syrupy marmalade notes, but the pal is bone-dry. Great mineral, some citrus dancing around on your tongue… just really interesting. A couple Winos grabbed some sushi off the buffet and said the pairing was phenomenal. We also tried his 2007 “Bright Red” rhone blend, another dynamic wine which Jessica thought “smelled like a rock.” Great herbal notes, coffee, red fruit — a lot going on. Dave’s distinctive wines were among our favorites of the day, and, priced at $15 and $20 respectively, they’re total deals. 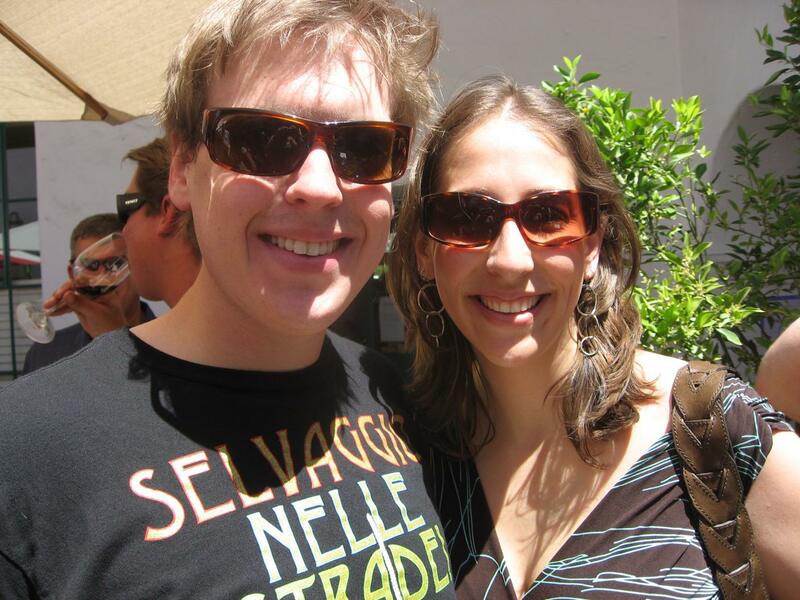 Married winemakers Bob and Louisa Lindquist were each pouring wines from their respective labels. The first we tried was Louisa’s 2007 Verdad Albariño. Several Winos picked up some bubble gum on the racy nose, which sparked a debate about which brand it was; we eventually agreed to Jessica’s identification of grape-flavor Bazooka Joe. The palette was crisp, with a lot of apple; like its cousins in Rías Baixas, this would make a great seafood wine. Next up was Bob’s 2006 Qupé Roussanne, done in one-year-old barrels. A big musky nose, which Jason likened to “walking into a wine cellar.” The moldy oak melts into toasty oak — a great bouquet. This led into a well-balanced palette with acid and oak dancing a nice box-step, as well as some big tangerine action. Finally, we tried two Syrahs, both of which represented themselves tremendously. The 2006 Qupé “Bien Nacido Hillside Estate” featured interesting oregano on the nose and a refined herbaceous quality on the pal, while the 2006 Qupé “Bien Nacido X Block” was an austere wine with a remarkable nose that I referred to as a “cornucopia of black pepper.” Sensational spice, extremely unique; we were very pleased to taste these. We ducked outside to dip into the 2007 Foxen Chenin Blanc, which Jessica thought smelled “like a bakery.” Jason and I got honeysuckle, leading us into a smooth palette on which some initial sweetness melted into nectary peach. “This makes me want to go on a picnic,” mused Jessica, who was already feeling the effects of her five or six tastes. Before we headed inside to escape the heat, Brander Vineyard scored big with their 2007 “Au Natural” Sauvignon Blanc and a round, opulent Chardonnay that wasn’t listed in our tasting guide. Yay for mystery bottle! Several badass wineries awaited us in the wine bar. 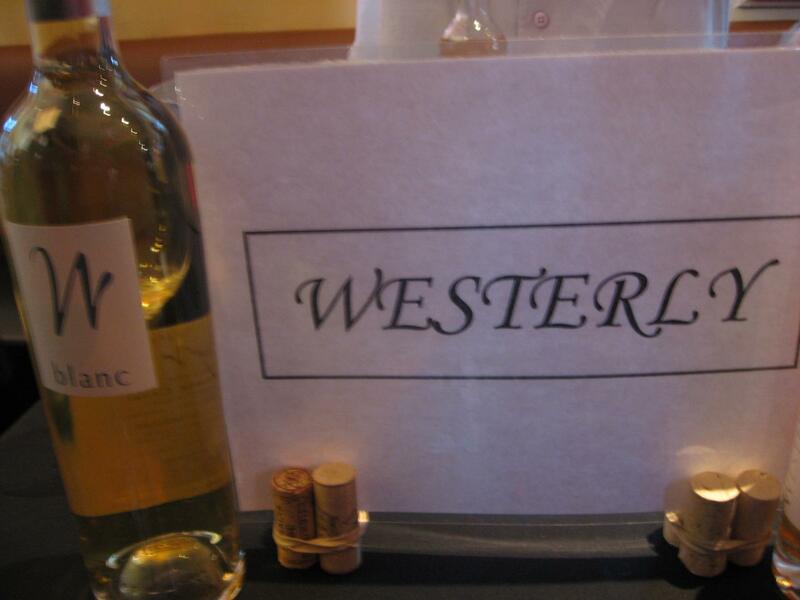 First up was Westerly, where we tasted the intriguing 2004 W Blanc, a blend of Roussanne and Viognier. Subtle and smooth, this was an understated Rhone blend with delicate fruit flavors and great texture. Our next pour was a big surprise: the 2005 “Après“ dessert wine, made from Viognier grapes which have been air-dried (rather than late-harvested or nobly rotten). With a caramel nose that Jessica described as “cake icing,” this light and silky little rascal coats your mouth like a wine of twice the texture; it was at once spicy and sweet, and Jason spoke for the group in proclaiming his deep affection for it. 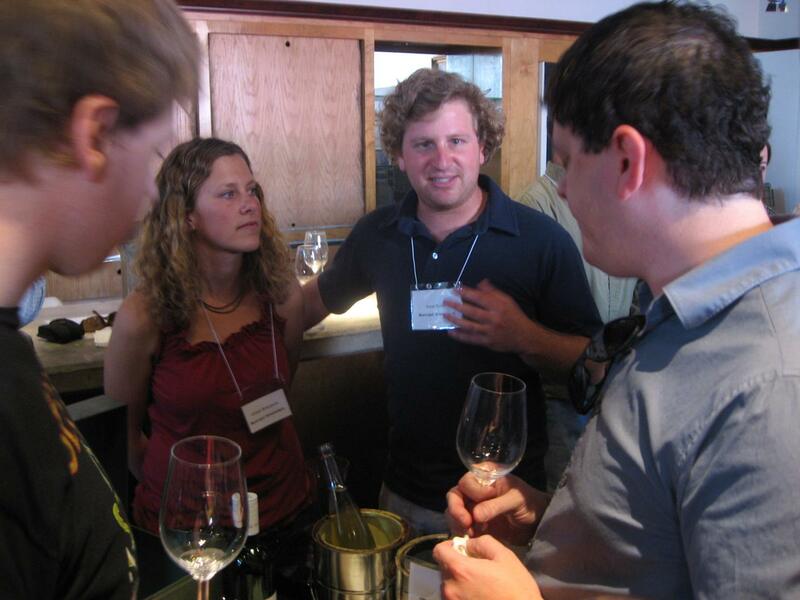 Moving down a few tables, we encountered Justin Willett, pouring his 2006 Tyler Chardonnay (Santa Rita Hills) and his 2006 Tyler Pinot Noir (Santa Maria). The latter was particularly special, and may have been Jordan’s favorite wine of the day; great Burgundian structure with a light floral nose and delicate fruit on the tongue. We made our way to Tercero, where winemaker Larry Schaffer poured us a couple of excellent Rhone-inspired wines from his brand new label. First up was his 2007 Grenache Blanc, thus far unreleased (as evidenced by the Bentonite particles still floating around in the wine… Larry explained that this clay-like substance is introduced to white wines early in the process in order to remove unnecessary proteins). Great acid on this well-structured little number, which was quite reminiscent of several of the Rhone whites we drank at this week’s tasting, including the Vieux Télégraphe. The red was his 2006 “Camp Four” Grenache, featuring a big cherry nose riding a wave of mocha underneath; these flavors repeated nicely on the light, spicy pal. 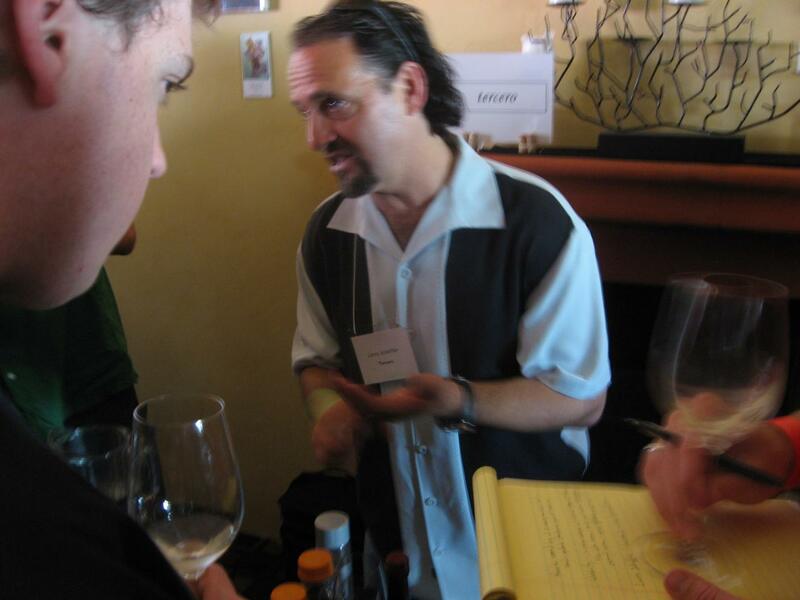 Larry’s an engaging personality who loves talking about his process, and the Winos look forward to keeping an eye on Tercero in the months ahead. 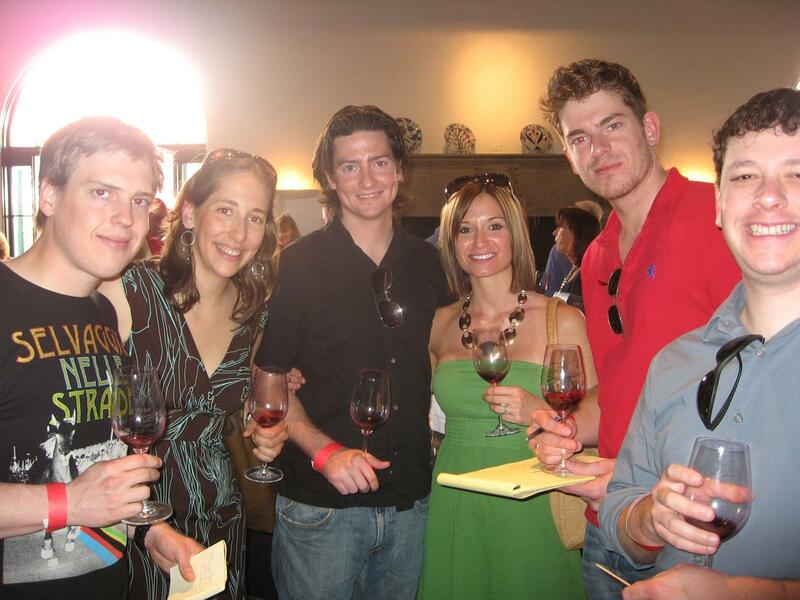 We wish we could’ve tasted all 200 wines; alas, we realistically drank probably no more than fifty. 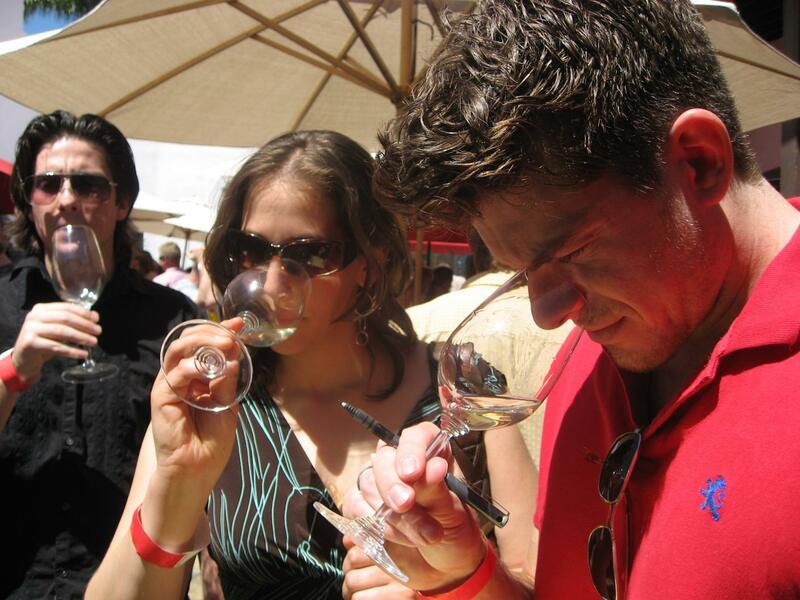 Sorry to all the awesome winemakers out there who we missed… perhaps you should have us come up for a visit? We’re only a couple hours away. —2005 Bozzano Merlot (Santa Maria). Huge inky nose, dark berries and burnt wood on the palette. This stocky slugger hits for average and power. 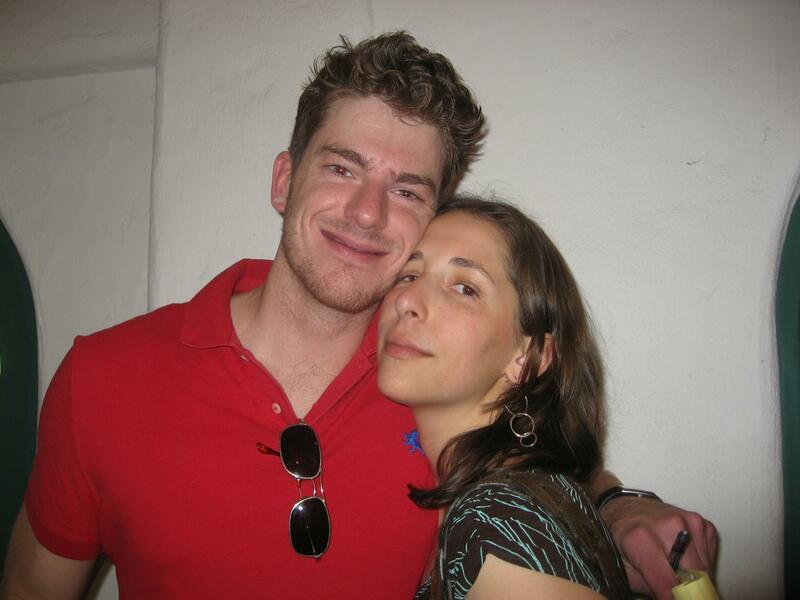 —2006 Carhartt Syrah (Santa Ynez). A great expression of the grape, with some game, black pepper, and nice round fruit. 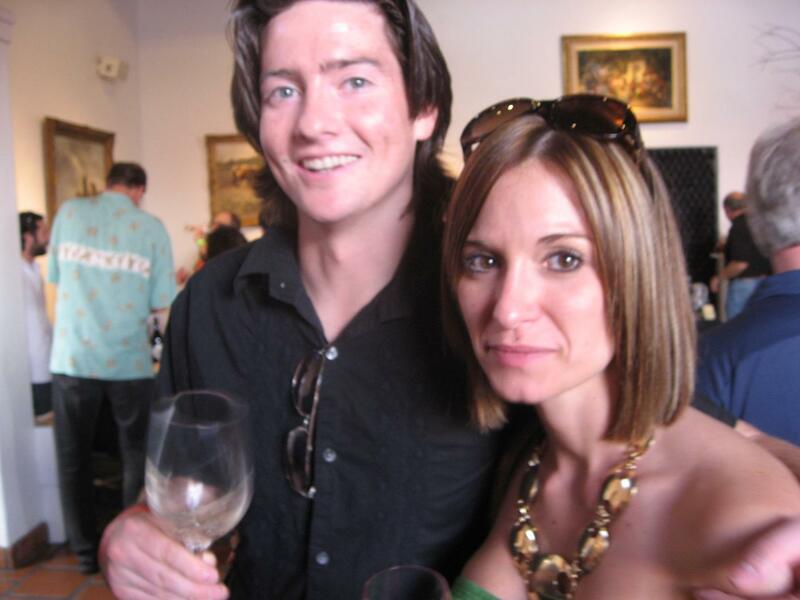 —2007 Coquelicot Riesling (Santa Ynez). Jessica’s “favorite Riesling ever,” featuring a nectar overtone without being syrupy, as well as some nice effervescence. 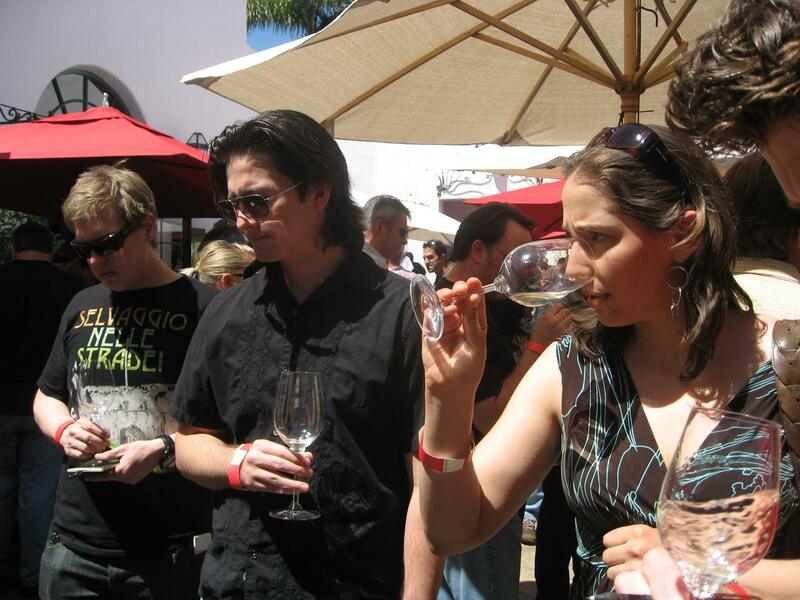 —2007 Jaffurs Petite Sirah (Santa Barbara). Absurd fruit on this one; raspberry, blueberry, even some orange blossom. Bursting with youthful vigor… can’t wait to see how it grows up. —2007 P2 Pinot Noir (Santa Barbara). A new-world Pinot that doesn’t go all fruit-Unabomber on you. Big dark berries with some great backbone. 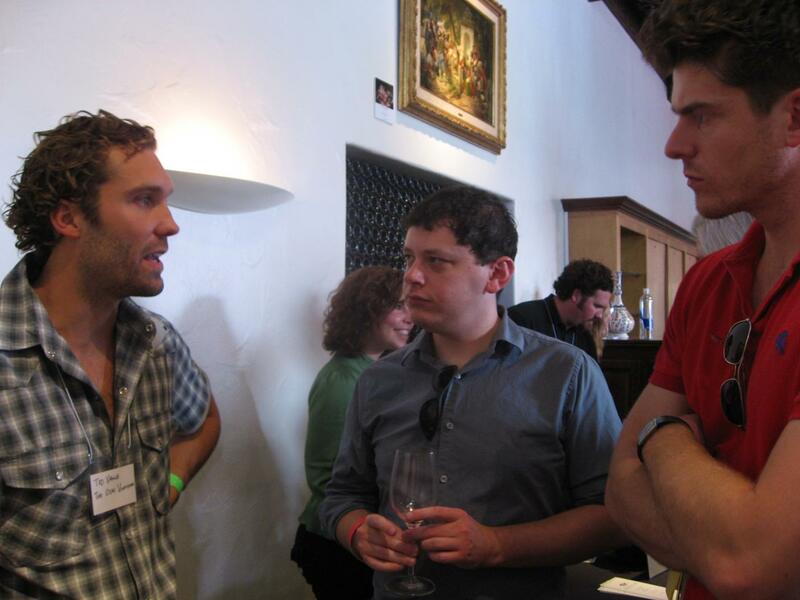 Jason and I chat with Ted Vance of Ojai Vineyards; Jason doesn’t like my handwriting; thanks to Dave Potter for the definitive group pic! 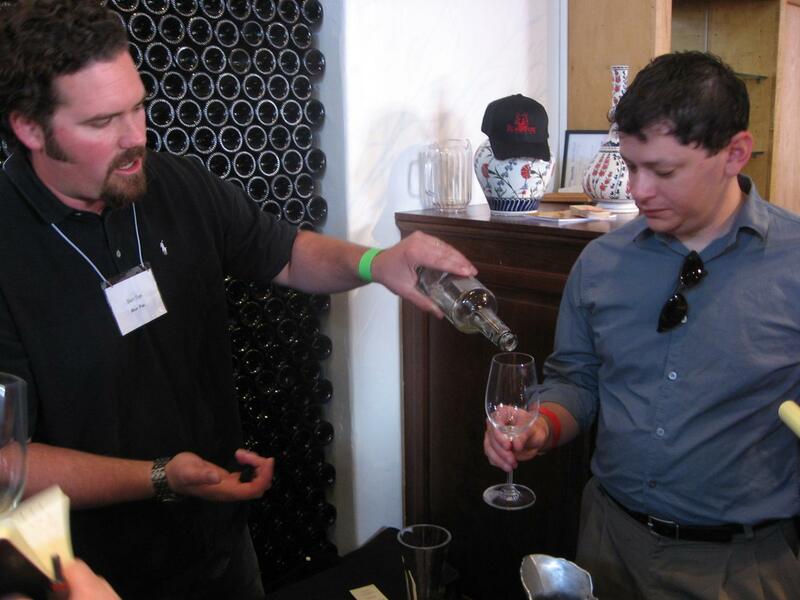 Just wanted to say how much I enjoyed meeting all of you at the Wine Cask Futures event this past weekend. Pretty impressive set of notes, guys and gals! You seemed to do a good job accomplishing your goals – you seemingly hit everyone there! Also wanted to let you know how much fun it was for me to discuss my wines with all of you. As you could probably tell, I love what I do, and love discussing it with other people. I really enjoyed the questions you had for me and hope I was able to answer them in a straightforward manner. The only wine not mentioned in your tasting notes was the one that I was actually pouring for the event, my Watch Hill Grenache! Must have spilled some wine over those notes, eh?!?!? Looking forward to hosting all of you up here or making it down there for a tasting. Please keep in touch! Cheers! 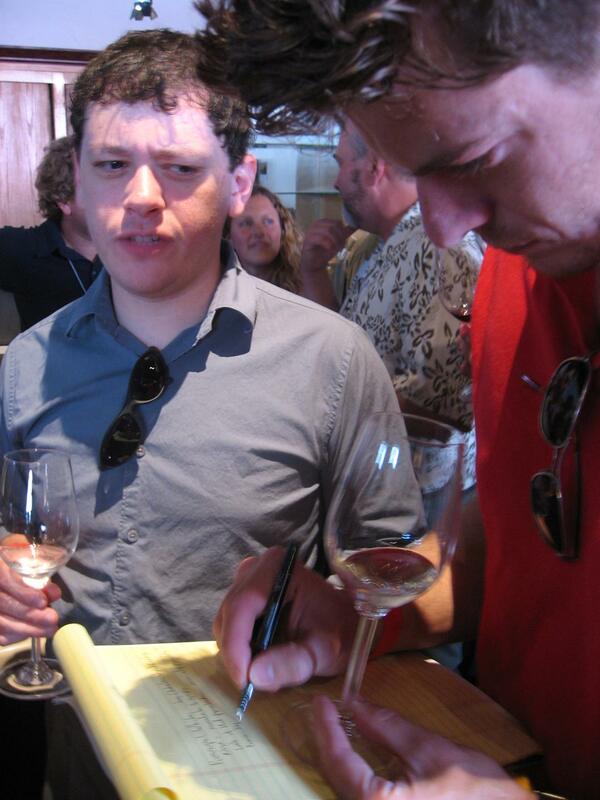 Larry — yeah man, no kidding, I’m still figuring out the fine art of “drinking a ton of wine while taking intelligible notes.” I recall tasting the Watch Hill, and I recall enjoying it… too bad I didn’t commit my reaction to the page. 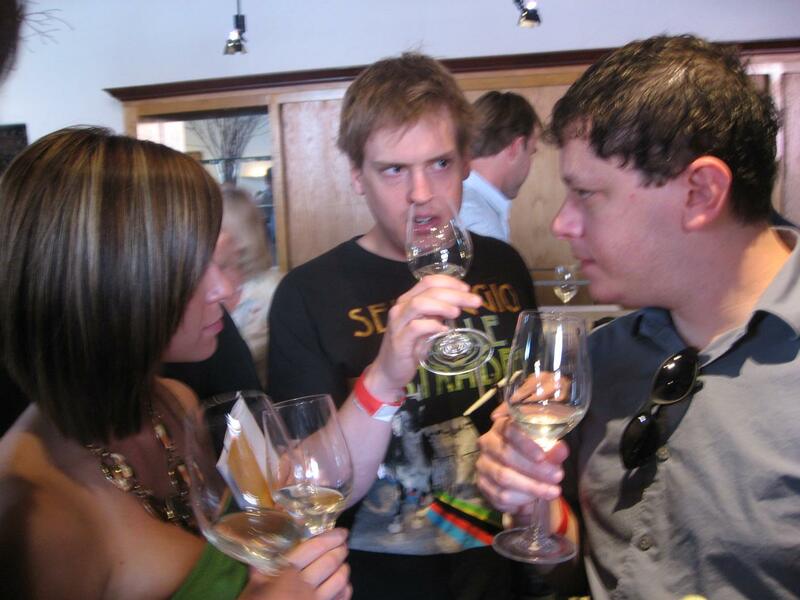 I look forward to being less rushed next time the Winos meet up with you and try your wines. Cheers! Thanks for stopping by and thanks for the props. Catch up again soon. I can’t believe I missed this. Employers who make you work on weekends are evil.